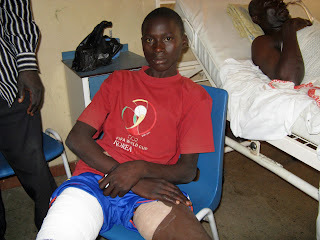 A wounded Nigerian in one of the many attacks by Boko Haram. Members of the radical Islamic group, Boko Haram, killed 29 Christians in two days, reports International Christian Concern. Twenty Christians were gunned down on January 6 while holding a meeting to discuss ways to transport a body of a fellow Christian who was killed in an attack a day earlier. The martyrs in the January 5 attack were attending a worship service at Deeper Life Church in Gombe when the attack took place. The killings followed a threat issued on January 1 by Boko Haram telling Christians to leave northern Nigeria within three days (for more information, click here). Boko Haram fights for the implementation of a strict form of Shariah law all over Nigeria, including the southern region of Nigeria where Christians are the majority. The Nigerian government declared a state of emergency to contain anti-Christian violence. Rev. James Wuye, a northern Nigerian church leader, has urged Nigerian Christians not to resort to revenge in the face of increasing attacks. He said, "I ask Christians in Nigeria that we should exercise restraint and pray that the God of Elijah will surely fight for us. And Christians should show love for their neighbours because that is what Jesus Christ teaches." 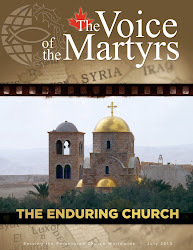 Pray the Lord will give Christians the grace and strength to resist taking up arms against their attackers. Pray the Lord will bring rest and peace to this troubled nation. Pray for those who have lost loved ones; may they be filled with the joy that comes from knowing that they will see them again at the coming of our Lord Jesus Christ (1 Thessalonians 4:15-18). Pray for the Nigerian government, the military and the members of Boko Haram. For more on Nigeria's suffering Church, please click here.